Edit: This was written Saturday, but posted today because I only recently stole pics from Kate. 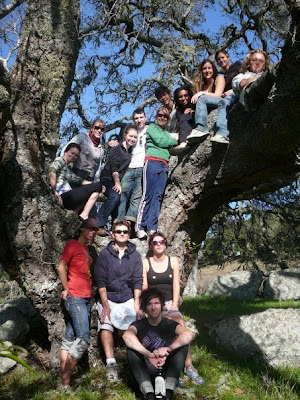 We just got back last night from a retreat into the mountains of Northern California. 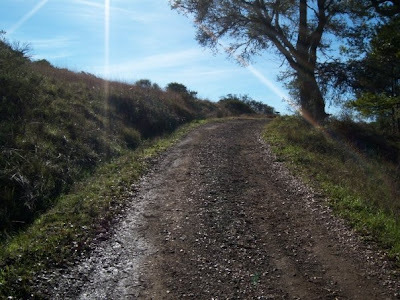 I was expecting it to be a kind of sketchy, with trust falls in the middle of the woods, but it was actually very nice. The only reason I really wanted to come home was that I hadn't showered in three days, and it was becoming more and move obvious to the outside world. When were looking over the ocean, which was about five miles away, and it was so beautiful with the clouds and the air ... you know, it was just so magical there, I can't even describe it in words. I started out the trip taking a lot of pictures, but I just got so frustrated that I couldn't fully capture it that I just gave up and hoped my eyes would do it for me. I really want to describe this place, but I'm having such a hard time! 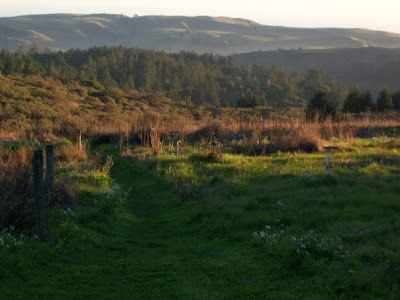 It was about 300something acres in Occidental, directly east of Bodega Bay, but at a higher altitude. And there were different barns and structures that we used for different types of meetings. We ate in "The Green Barn" and we slept in what we called "The Sleeping Barn." 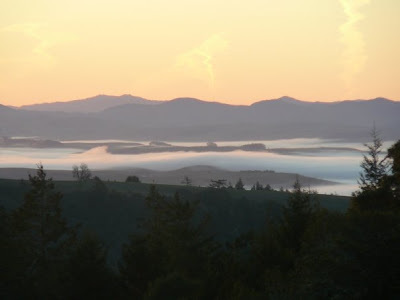 We had our lessons in a cupola called "The Sanctuary" that has huge windows on each wall that looked out over the valleys and trees, all the way to the ocean. There are residents there too, who all have their own little houses and lives, but also have a responsibility to take care of the property. 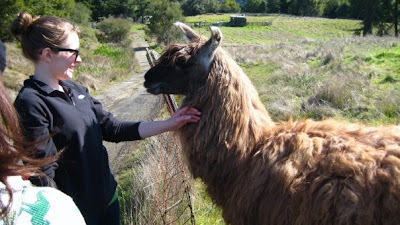 There was also a pet llama on the property named Pele, with whom Kate was particularly enamored. At the last minute of our trip we got to feed Pele and brush him, which was pretty awesome. As for the training, I'm probably going to post about it later. Some parts were good, others not so good. As a whole though, I'm glad we all went and I do feel a lot closer to some people in the group that I didn't feel that close to before.